Only Spain ~ Boutique Hotels is the brainchild of Rachel Webb a long-time resident of rural Andalucia and even longer-term lover of great hotels. As a child she travelled with her parents staying in the best hotels.She then chose to work in the tourism industry which she did until having a family and moving to rural Spain. Since moving to Andalucia in 1996 she has explored and written about Spain via her blogs at Luxury Spain Travel and Andalucia Explorer but beautiful hotels and top class service are her passion. She is continually planning trips to discover more of this large, vibrant and exciting country. 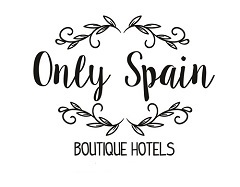 Only Spain ~ Boutique Hotels is her baby born out of her passion for the best of Spain and fabulous hotels and she is now sharing with the world her growing compilation of boutique hotels, small and owner-run but sometimes larger chain hotels too. All the hotels which make the collection are ones which appeal to her sense of what makes a hotel great. Most hotels have been individually visited by her, some recommendations come from her large network of contacts across the Spanish mainland and islands. Why Only Spain? She believes that when planning a getaway the country has already been chosen, so why have an international range of hotels on one site. Spain is her home and her expertise. Being knowledgable in Spain and Spanish travel she also offers a Trip Planning Service via Only Spain for discerning clients who look for the best in accommodation and something different in their experience for their visit to Spain. If you’re looking for unique, hand-chosen special Spanish hotels take a look through the Only Spain~Boutique Hotels collection, whether you want an urban, city hotel or a really rural retreat, an adult-only or a hotel geared for children you will find some of Spain’s best hotels on Only Spain.